With green flag for the Mobil 1 Twelve Hours of Sebring fueled by Fresh from Florida scheduled in only 10 days, last moment preparations for the 2012 American Le Mans Series' inauguration for some teams included the signage of Canadian sports car standout Kyle Marcelli. A member of driving team in three class victories during the 2011 Le Mans Prototype Challenge-type competition, Marcelli is part of the newly-formed American Le Mans Series team Merchant Services Racing. Freshly 22 years old, Kyle Marcelli ended the 2011 season as one of the fastest drivers in the Le Mans Prototype Challenge (LMPC) category. Racing under contract with Intersport Racing for the past two seasons in ALMS, the young Canadian driver has illuminated to a shining star as the reliability of the Chevrolet-powered Oreca race car became more solid. Recording his first major sports car racing victory at Imola, Italy, the initial entrance into victory lane lit a fire underneath Marcelli's ALMS efforts. During the summer of 2011, Kyle Marcelli co-drove his #89 Intersport car to LMPC class wins at the tredorious Mid-Ohio race and the debut Baltimore street race. Kyle Marcelli's 2011 American Le Mans Series ended with third place in the overall LMPC points standings. A brand new LMPC effort, Merchant Services Racing will field two Oreca FLM-09 race cars starting with the Sebring race. President and CEO of Merchant Services Chapman Ducote has made the 2012 team's presence possible. “When given the opportunity, we jumped at the chance to be the title sponsor of Merchant Services Racing,” said Ducote will is also a co-driver of the #7 set to be shared with Javier Acheverria and Pablo Sanchez. Kyle Marcelli will pilot the #8 Merchant Services Racing machine Lucas Downs and Dean Stirling. In response to joining the new team, Kyle Marcelli said, “Although we’re a new team this year, we have a tremendous amount of combined experience, between our team principals, managers, engineers and drivers. 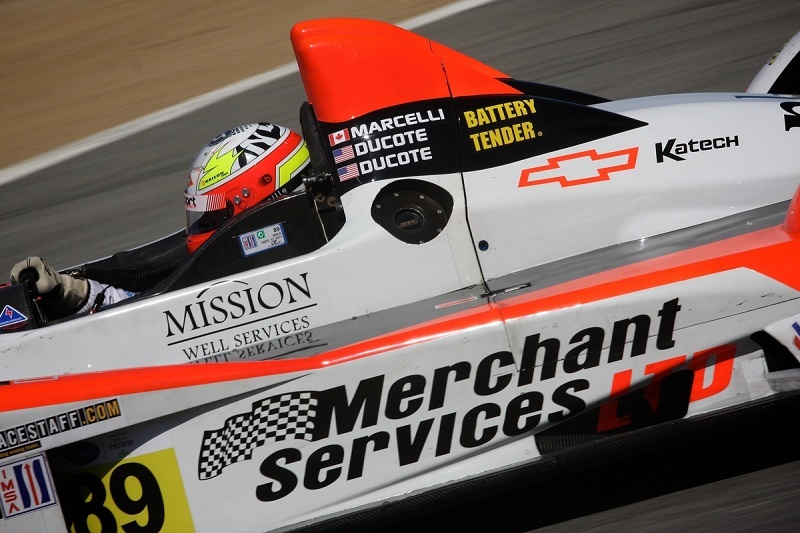 It is not our first rodeo and we have our sights set on the top step of the podium.” Kyle Marcelli already has a professional sports car racing history with the Merchant Services name. Last year, Marcelli drove a #99 JMB Racing/Merchant Services Limited prototype to his first major sports car racing class victory at the Imola six-hour event. Kyle Marcelli and the whole Merchant Services Racing team will be put to the test at Sebring on March 17th.